Darkness Spoken collects Ingeborg Bachman’s two celebrated books of poetry, as well as the early and late poems not collected in book form. This edition also contains 129 poems released from Bachmann’s archives that have never before been translated. Twenty-five of these poems appear in German in this bilingual edition for the first time anywhere, making Darkness Spoken the most complete volume of her poetry in English and German. Born in Austria in 1926, Bachmann is considered one of the premiere German language poets of her generation. Her various awards include the Georg Büchner Prize, the Berlin Critics Prize, the Bremen Award, and the Austrian State Prize for literature. 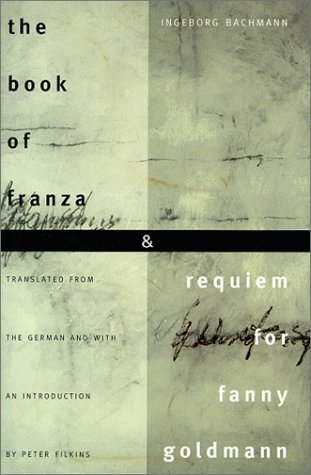 The Franza Case and Requiem for Fanny Goldmann, by Ingeborg Bachmann (Translator). Evanston: Northwestern UP, 1999. These unfinished novels, Ingeborg Backmann’s only untranslated works of fiction, were intended to follow her widely acclaimed work Malina in a cycle to be entitled Todesarten, or Ways of Dying. Although Bachmann died before completing them, The Book of Franza and Requiem for Fanny Goldmann stand on their own, continuing Bachmann’s tradition of using language to confront the disease plaguing human relationships. Through the tales of two women in postwar Austria, Backmann explores the “ways of dying” inflicted upon the living from the outside and from within, through history, politics, religion, family, gender relations, and the self. Bachmann’s perception of fascism as not being limited to the context of the war but also existing within the intimate relations of everyday life– between husbands and wives, brothers and sisters, psychiatrists and patients– is evident in The Book of Franza. A woman escapes from a sanatorium and, after years of silence, sends her brother a cryptic telegram. Rightly suspecting that she has fled her sadistic husband– a renowned Austrian psychiatrist whose intimate relations have merged with his studies of concentration camps– her brother finds her in their childhood home. They travel to Egypt, where Franza slowly begins to regain her bearings. But Franza’s desire to cleanse herself by journeying into the heart of the desert’s void ends in tragedy. The heroine of Requiem for Fanny Goldmannmakes no attempt to escape her history. Fanny, a Viennese actress, is manipulated by an ambitious playwright. Deception follows disloyalty, and the final treachery comes when the playwright portrays her in a novel, securing his fame but robbing Fanny of her future. Caught in a perpetual stasis, suffering in obscurity, Fanny’s present is stolen from her as well. Whether analyzing the place where the self begins and the power of history ends, or the ways in which women are forced to be complicit in their mistreatment at the hands of men, Bachmann’s critical approach to the human psyche is unparalleled. The Book of Franza and Requiem for Fanny Goldmannprove that Ingeborg Bachmann is the most important female German-language writer of the postwar period. Songs in Flight: The Collected Poems of Ingeborg Bachmann (Translator). New York: Marsilio Publishers, 1994. 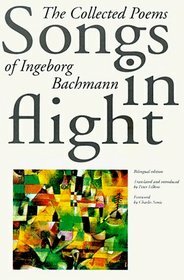 Songs in Flight gathers together Bachmann’s two celebrate books of poetry, as well as the early and late poems not collected in book form. Given that Bachmann and Paul Celan are considered to be the two most important poets to emerge in post-war German letters, this volume represents an introduction to a major voice in 20th-century poetry that is long overdue. Influencing numerous writers from Thomas Bernhard to Christa Wolf, Bachmann’s poetic investigation into the nature and limits of language in the face of history remains unmatched in its ability to combine philosophical insight with haunting lyricism. Just as Bachmann’s Malina sought to expand the possibilities of the novel, Songs in Flight contains the bedrock of a vision as far reaching as it is indelible, and as uncompromising as it is bound to hope.